iPhone Rollout at 'The Shack' Earlier than Expected? 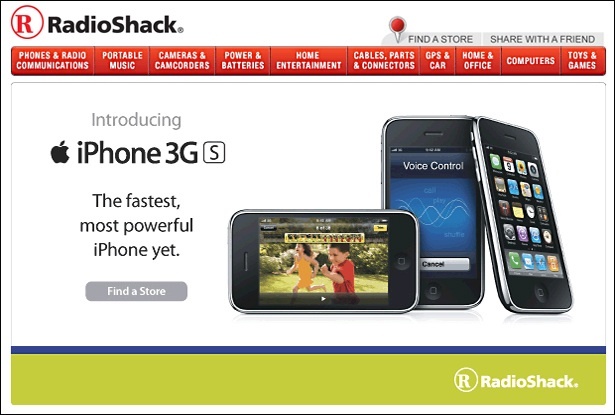 NEWS: (12.10.09)-- In a press release last month, RadioShack announced that they would start carrying the iPhone 3G and 3GS in limited release with availability at all its chains planned for 2010. In an announcement to its email subscribers today, it appears the device is being rolled out nationwide earlier than expected. AD: If you're in the market for a new iPhone or upgrading your existing model, check out iPhone Prices before you head out to the Apple Store, AT&T, or now RadioShack to find out the best deals. Also, don't forget, you can take us with you everywhere you go by getting PB|Central.com on your iPod touch or iPhone. Just click the "+" button and add us to your home screen! In November, RadioShack said they would initially rollout the iPhone, "...in a limited number of company-owned stores in the Dallas/Fort Worth and New York City metropolitan areas beginning later this month. RadioShack expects to introduce the iPhone in stores nationwide in 2010." A section on their website shows it to be currently available in select markets across the U.S. in 18 states, including: Arkansas, California, Florida, Illinois, Indiana, Maryland, Michigan, Montana, Mississippi, New Jersey, New York, Oklahoma, Tennessee, Texas, Virginia, Washington, D.C., Wisconsin, and West Virginia. A total of 180 cities are included in that list. 49 stores in Texas and 62 in New York are now selling the iPhone in addition to 140 more listed stores in other states. RadioShack's presence in New York and Texas almost triples consumer access to the device in those markets with this new partnership with Apple. Of note, Apple, Inc. does not currently have retail stores in Arkansas, Montana, or Washington, D.C. In an interview this morning, a RadioShack company spokesperson said, "We are continuing our gradual roll-out as previously announced... expect [the] iPhone to be available at RSH (RadioShack) nationwide in early 2010." The spokesperson also confirmed that approximately 250 stores are now carrying the iPhone. According to the company's corporate page, RadioShack runs 4,470 company-operated stores, the only--as of press time--locations the iPhone will be sold at. There are over 200 Apple Retail Stores worldwide, roughly 22% of RadioShack's operation in the U.S. alone. (200 company-operated RadioShack stores are located in Mexico, but unknown if it will be part of the deal). Joe Leo begins his third year as a columnist for Power|'Book Central. His passion for writing, along with his extensive background in journalism and technology, are a perfect complement for this educator and professional freelance journalist based in San Francisco, CA.